Pictured here is an image of a 737 MAX 7 in the Southwest livery. SEATTLE, May 15, 2013 /PRNewswire/ -- Boeing (NYSE: BA) and Southwest Airlines announced today the launch of the 737 MAX 7, the third member of the 737 MAX family. The Dallas-based carrier and launch customer for the 737 MAX program became the first airline to order the 737 MAX 7, when it converted 30 existing orders for Next-Generation 737s into orders for the 737 MAX 7. Southwest also exercised options to add five more Next-Generation 737-800s to its fleet. These airplanes, along with the 737 MAX 7s, are part of Southwest's ongoing effort to improve fuel efficiency and profitability. The 737 MAX 7 supports Southwest's expanding fleet modernization effort. Southwest is expected to take its first 737 MAX 7 delivery in 2019. 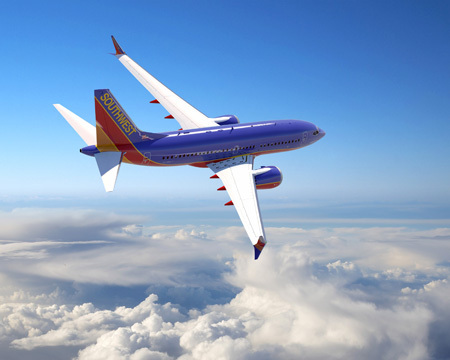 "We are thrilled to announce that Southwest Airlines and Boeing have entered into an agreement for Southwest to be the launch customer for the Boeing MAX 7 series, with deliveries beginning in 2019," said Gary C. Kelly, Southwest Airlines Chairman of the Board, President, and CEO. "The 737 MAX 7 builds on the strengths of today's Next-Generation 737-700, incorporating the latest CFM International LEAP-1B engines is expected to reduce fuel burn and CO2 emissions by an additional 12 percent over today's most fuel-efficient single-aisle airplane." The 737 MAX 7 brings the most advanced engine technologies to the world's best-selling airplane, building on the strengths of today's Next-Generation 737-700. The 110-ft long airplane incorporates the latest CFM International LEAP-1B engines to deliver improved efficiency with the most reliability and passenger comfort in the single-aisle market. The 737 MAX 7 also will extend the range over today's 737-700 by approximately 400 nautical miles (741 km). "Southwest has been a valued partner in the evolution of the 737 program," said Boeing Commercial Airplanes President and CEO Ray Conner. "We have worked together to launch several models of the 737 including the 737 MAX family in 2011. We are excited to bring the 737 MAX 7 to market with Southwest." With the MAX 7 conversions and exercised options for 737-800s, Southwest's unfilled orders consist of 180 737 MAX airplanes and 137 Next-Generation 737s. The 737 MAX now has orders for 1,315 airplanes.